Chapter four goes into great detail about types of photographs. The author explains 6 different types of photography. I was unaware that there was so many different types of photography. I guess I just have never thought about it. The categories are; descriptive, explanatory, interpretive, ethically evaluative, aesthetically evaluative, and theoretical. Each type of photography is thoroughly explained and has the photographers work for an example. 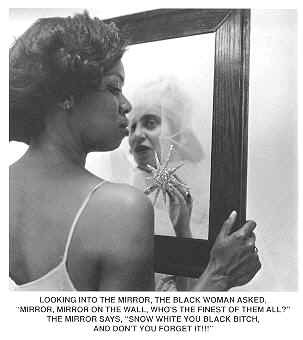 The image that most stood out to me was the reflection image called "mirror, mirror" by carrie Mae weems. I am trying to work with reflections for my persona assignment. I really like how this image is set up formally and I like the idea of looking through a mirror but someone else being on the other side. I would really like to experiment with this concept. I wanted to include my sisters in my persona assignment because they are a big part of who I am but I didn't know how to incorporate them. So I would like to follow similarly what this image is doing but have me look into the mirror and my sister on the other side of it by photoshopping it.